this is just beautiful. i do not think any other army has said this so eloquently to their people. i just had to share this. the mega millions lottery ticket today is mega large today. whenever i think about the possibility of winning the jackpot and how i would live my life after i won my mega millions i wonder how i could live that way even if i never won those mega millions. do i really need mega millions to live a utopian life? if i would have the mega millions it would certainly help, but not everything in utopia requires mega millions. thank goodness. money can't buy heath even though it can help maintain it. inner peace does not require a large check. true friends are more valuable than money. money can't make the sun shine or the rain drop. being rich does not prevent depression or make one a confident person. kindness to others and creativity does not require mega millions. mega millions can enhance all these qualities, but it is not required . hopefully i will remember to buy a mega millions ticket, but if i don't i will still strive to live the enriched life i envision for myself. more about the situation of jews in france. i have a few friends who have had nose jobs. one friend in particular had a really "bad" nose . i understand why they did it , but the truth is i think people are best off not doing plastic surgery unless its medically necessary . plastic surgery is still surgery. several years ago there was an author named olivia goldsmith who did plastic surgery and died from it. i am sure she went to a great surgeon, but surgery always has its risks. i also remember a story of a bar mitzvah boy who had a nose job for his bar mitzvah present and also died from the surgery. i know a lot of people who have had face lifts to correct wrinkles. with the results that i have seen these people would have better spent their money on a nice vacation. they did not look that great. the wrinkles would have looked better than looking like one is permanently startled. often people don't just one surgery. once you start with surgery you start finding more things wrong with yourself. unless you are an actor or someone in the public eye i think that its best to just make do with what hashem gave you . even the best plastic surgeons cannot make one look like one is twenty. plastic surgery cannot erase the look of "wisdom" in ones eyes as it shouldn't. every day i hear of women x years (very) old giving birth to healthy babies that were from her own egg. other times i hear of sixty year old men marrying women young enough to be their daughters. both of these scenarios are like crack to those with unrealistic expectations. i do not care which is more likely, its just interesting to note that each gender has its own share of unrealistic expectations and it really is quite amusing to sit back and laugh at. it would be even more to poke fun of if i wasn't still single. goodbyes can be difficult especially when they are final. worse than saying goodbye is not being able to say goodbye. the last time i saw my grandmother a"h i did not realize that it was going to be the last time that i would see my grandmother. to this day i wish that i would have given her a proper goodbye . at the time she was ill and she fell asleep during the visit. when i left i said goodbye but it just looked like she wasn't feeling good and i didn't want to wake her so i did not make an elaborate goodbye when we parted. a month later she passed away. when my dad died a"h i did not get to say goodbye but i was with him the last day of his life . his passing was unexpected, so there were no goodbyes. both my grandmother and my father have visited me in my dreams which has helped the process of closure. it must be even more awful to sit by someone in the hospital and see the life force separate from the body even though at that point one is able to say goodbye because one knows what is coming . there are two people that i have been able to say goodbye to , one (to my knowledge) is still alive and one who is not. not long after my dad died a 79 year old client dropped by my job to say goodbye to everyone. she was dying of cancer and she just wanted to say farewell. i was glad that i was there at the time. she was such a lovely lady. i have another acquaintance who has als (lou gherig's disease). he told me when he had been diagnosed with it. i had no words. i had the honor of seeing this individual recently. though i was teary eyed, i made sure to say goodbye. i do not know if we will ever meet again on this earth. i know his wife and son. they are in so much pain. its a dastardly disease. the person is alive and dead at the same time. i can't be so serious as to have a mindful goodbye every time i say goodbye to someone. it would be too depressing. i just try to appreciate the friends and loved ones in my life as much as i can. in case anyone is interested , the creator of the israeli tv show srugim, laizy shapiro, will be speaking at the jcc in manhattan at five pm this sunday about the making of the series srugim. as jews we are all in mourning after the brutal murders of rabbi jonathan sandler 30 years old and his sons arieh 6 years old and gabriel sandler 3 years old as well as the brutal murder of seven year old miriam monsonego in toulose france on monday morning. they were murdered at a jewish school called ozar hatorah. i have never heard of toulose , france until monday morning. hashem, i love your world and its beauty. i would have much preferred to have visited toulose on holiday instead of seeing this aesthetically beautiful city ravaged by anti semitism that has murdered innocents namely three children and and a father. i read somewhere that little gabriel sandler was named for gabriel holzberg who was murdered in mumbai november 2008.
i send my love to the grieving families- the sandlers and the monsonegos as well as to all of the jews of toulose france. i am so sorry for your loss. it is not just your loss , but a loss for all of the jewish people and for all of the world. who knows what wonders these fallen young people could have done for the world had their lives not been cut short. what strikes me so much is how beautiful this city looks and how very sad that this has happened. lately i have noticed that when i hear of couples marrying i have been genuinely happy for them. its not that i was not happy for others mazal before, but my joy from them was not complete. i was happy for them but still a little sad for myself. this scares me a bit because i have always thought that if you feel a little envy for others it can be motivating. it means one has not given up . it means one has not fully accepted one's single state. or does it? is it possible to be genuinely happy for others without meaning one has given up? i don't think that i have given up. but i have felt genuine joy for others who have found love. i am not fool enough to think that if one can be happy for others who get married that it will make me suddenly find love. there is no secret magic formula. that much i do know. one reason i really enjoy attending events at the jcc manhattan, or the 92nd street y is because jews of different streams mingle in a non-kiruv venue. i wish that there was more of this in nyc and i for one plan to attend such events. this kind of mingling of jews is something that i enjoyed about living in the midwest. i think that these venues create a sense of jewish unity that people forget about. ahavas yisroel for those who arent necessarily as religiously observant as you are. a kiruv group can't achieve this, a jewish social organization can. when i was a kid i was taught that when one does a mitzvah lo lishmah bah lishmah. when one does a mitzvah without the proper intention you will eventually do it with the proper intention. this is so profound. this means that hashem knows that people aren't always on the level to do the mitzvah totally lishmah and will give us points for a mitzvah even if it is done by rote. this also means that one should not look down on those who are religious but are shomer shabbos more because this is how they are than because they consciously made the decision to become religious. it also invalidates those who won't do mitzvot because they don't believe in them even if they might get enjoyment doing them lo lishmah. a few years ago i went to a book reading that featured shalom auslander of foreskin's lament fame. at the event he proudly shared that he specifically did not want his wife to light chanukkah candles if she said any brachos when she lit them or if she assigned any religious meaning to them because he did not believe in any form of religion. he was just so frum about not being frum. being an observant jew is not for everyone. i get that. i also think that its ok to be an observant jew without ideologically agreeing with every aspect of the religion. i also think that its better to observe a little of the torah than nothing at all. i do not think that hashem expects everyone to be perfectly observant , i think he just wants us to do as much as we are able to at whatever level we are on. yeah, i know the weight watchers diet well . i also know the low carb/south beach diet because i have friends who have done them. i am sick of diets. they don't help me with the one thing that will help me lose weight. eating to be thin never makes me feel satisfied. i may not be hungry but i definitely won't be satisfied. satisfaction must be found in a non- food way. eating too much is not the answer . i need to find another way to fill the void. there was one other issue that was discussed at the srugim screening yesterday that i would like to share with you. one thing amos tamam suggested that there are two types of people who are modern orthodox. there are those who have the struggle to strike the balance between being secular and between being religious and then there are those who are at peace being part of both worlds and at peace with who they are and he suggested that this was a better way to be. there does not have to be a struggle. i found this concept profound because i never had thought of it like that before. i never thought that there would be a struggle even though i know that that struggle often pushes some off the derech. someone off the derech told me that they admired the struggle that modern orthodox people had over being part of the world and being frum. i had found it funny at the time because i never thought of it as a struggle at all because being orthodox and enjoying the world was always a part of my life . i never thought that i was missing anything by being religious because i was also always able part of the secular world as a frum person. i am used to being the different one at work yet able to be part of the chevra , not the oddball. i value being an observant jew. i do not think that life is all or nothing as many do. there is a lot of trief in the world , but not everything is trief . i could not be frum if i lived with blinders on and never enjoyed anything secular.that which is secular in my life enhances the religous side of my life . i feel secure enough to be my own person. those who don't respect you might not respect you even if you weren't frum. i used the label modern orthodox here, but i include anyone who is orthodox regarding this issue. life is all about balance . tonight i attended the jcc manhattan showing of the first two episodes of srugim season 3 which included the actor amos tamam who played amir on the show. it was so much fun. there was a mostly younger crowd in attendance which was refreshing. it has been my observation that israeli films tend to draw in the young people much more than just jewish themed films.the israeli flim festival has more attendees under thirty five than the jewish film festival does. the jewish film festival is excellent and has films that younger attendees would like if only they'd bother to attend.. there is something about israeli films that interests the younger set. needless to say watching the first two episodes of season 3 of srugim was a treat, but to meet one of the stars of srugim was an even bigger delight. after the screening the audience was treated to a 40 minute conversation with amos tamim the actor who played amir. he spoke in hebrew and translation was provided . fortunately i understand hebrew pretty well so it was especially fun. though not religious, amos tamim grew up traditional and did know about torah and mitzvot even prior to playing amir on the show. he also always has had a respect for frumkeit and enjoys studying the parsha etc even though he is not dati. he is also a fabulous actor because he is nothing like amir, but when he plays amir he completely embodies his character so much so that israeli fans are totally convinced that he truly is like amir in real life. what i learned tonight is that srugim has really impacted the secular israelis. they watched srugim and really enjoyed it. they saw men and women interacting in a wholesome manner and they saw a tv show that was clean and they actually liked it.they saw religious jews as multi-faceted and that you could live a normal life and be religious. srugim is a very realistic portrayal of modern orthodox single life in israel which is why it is so beloved even in here in america. the portrayal of the singles in srugim is the closest thing to my world that i have ever seen on tv anywhere. laizy shapiro did not think that americans would relate this show so much because he did not realize how similar single modern orthodox life is in israel to moderen orthodox single life in the united states. in a way this makes us feel closer to the israelis. which is amazing. amir was originally intended to be ashkenaz, but because laizy shapiro liked amos tamam so much and wanted him in the role he changed the script to make amir's character be a tunisan jew which amos tamam is. i am glad that they did this. i liked the interaction between the ashkenazim and the sephardim and how amir explored his feelings toward his heritage. it made the story richer.and heck amos tamam is just so darn cute even in those dorky glasses that he wears when he plays amir . after the conversation with amos tamam the cell phone cameras and regular cameras came out and many of the female srugim fans took pictures with amos tamam. yes, i made sure to get a picture with him as well though i have not posted it here. he is just so adorable , who could resist? the rest of season 3 will be shown at the jcc starting next monday and every monday through april 23 , excluding the monday during pesach. there won't be any of the actors there in person, but the episodes are addictive must see tv. so many singles say that everything would be perfect if they were married. others say everything would be perfect if they were rich. some parents of small children can't wait until their kids were just a little older because they would get more sleep. everyone wishes that they were thinner. it will better when the weather is a little warmer/colder. students can't wait until they graduate. those on the job force are looking forward to retirement. those who live in apartments would love to own houses and those who own houses think that life would be perfect if only they owned a second home in florida/israel..
often when people find themselves they find it hard to understand why everyone does not believe as they do and they become intolerant of those who still adhere to beliefs they no longer adhere to. when people go off the derech they become so comfortable with who they are that some (not all) become intolerant of those who still believe. this of course is the other side of the coin of when someone who becomes baal t'shuvah who does not understand why anyone can remain secular once they have seen the light of the torah..
just because you may be otd does not suddenly mean others won't believe in being frum. deal with it. just because you may have frummed out does not mean that all of your relatives will abandon their secular lives after spending quality time with frum people. just because you may have made these decisions does not mean others will no matter how much you would like them to. today was/is shushan purim. for those in jerusalem it was purim for those of us in the united states its the day we try to recover from eating so much shalach manos. if you are like me it is a day when you are still eating shalach manos. i brought all of the shalach manos that i don't prefer to work and left the good stuff at home . not very good for the diet, but purim is but once a year and some of the nosh i received yesterday is just doggone good to give away. have a good shabbos all. unless you have been living in a cave for the past year , you have heard about the israeli tv series srugim. srugim is an israeli tv show about modern orthodox singles in their thirties living in jerusalem. i have watched the first two seasons . its a lot of fun to see jewish singles in israel dealing with the same issues their american jewish and single brethren are going through. the third season has recently ended on israeli tv marking the end of the series. technology is amazing i remember how it took such a long time before movies and tv series would be on video. apparently the jcc of manhattan is will be screening the third season of srugim beginning on tuesday march 13 at 7:30 pm -9:30 pm. on march 13 amos tamam who plays amir will be present . after that the series will be screened five mondays march 19, march 26 ,april 2, april 16 and april 23 from 7-9 pm. every screening will feature 2 episodes except for the last week which screens the last three episodes. for more information look at the jcc manhattan's website. the series is in hebrew with english subtitles for those of us whose hebrew could be better. i can't wait to see the third season of srugim, but i am also kind of sad about seeing the third season because it is the last season of srugim. 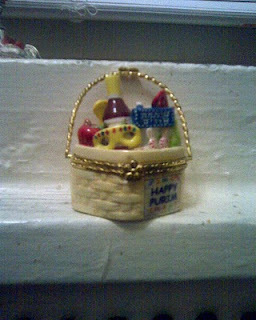 purim is one of my most favorite holidays. 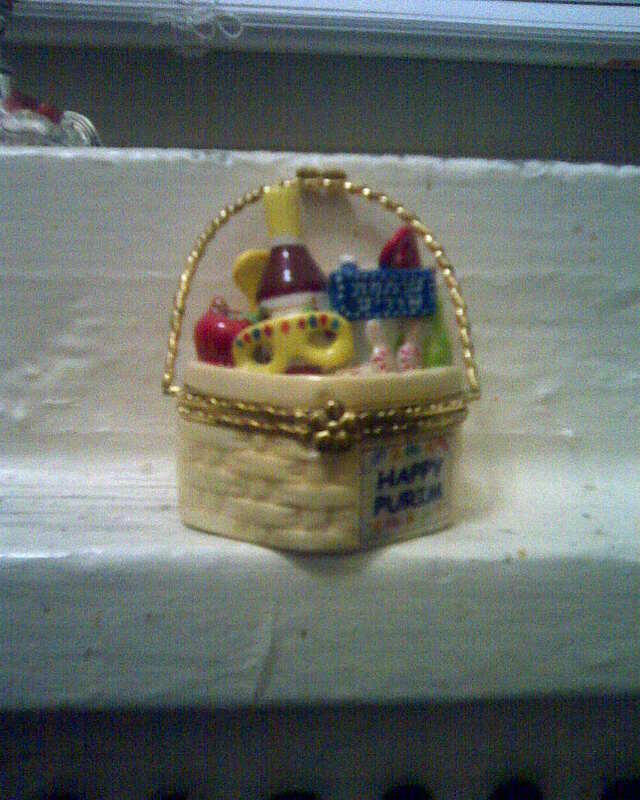 this year i have found one of the cutest containers for my shalach manos. i just had to share this picture with you. this is my shalach manos to my readers. this is the least caloric shalach manos you have recieved this purim. HAPPY PURIM TO EVERYONE! i love hamantashen so i have photographed my favorite cookie . 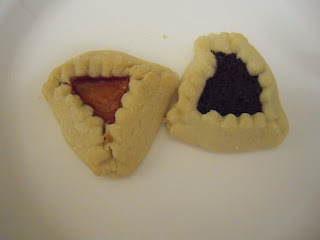 enjoy my photos and have a fabulous hamantahsen filled purim. once again i have experienced mr. toad's wild ride upon the q train this evening. i'm still reeling. how i long for an eight o'clock subway ride home that is peaceful. i boarded the train this evening at seven-thirty after waiting for ten minutes for the train to come. i got a seat. some crazy woman hovered over me and pushed me as she was standing in front of my seat. its times like these that i wish i was six feet tall and three hundred pounds. if i was that large this lunatic would not have wanted to stand anywhere near me. at some point a very disheveled sixtyish man sat down on the floor near me and i offered him my seat. of course the loony woman moved , as well as the other few people who were standing near where i had been sitting. note to self, dress more disheveled on the train, you will then have room to sit. fortunately when i was standing there was a lot more space than when i had been sitting and i finally got another seat when i was three stops from home. the only good part of the ride was that it was too crowded for the acrobats to do their routine on my train. i really have to find a job that is walking distance from my home. riding the trains is for the birds. i just finished reading the book unorthodox by deborah feldman.. i agree with curious jew's opinion of the book. it is not that bad for the frum world. deborah feldman is a rebel who grew up in the satmar community. it is a little cloying to read about her snarky view of frumkeit as she is growing up but this is her story and this is how she felt about it. when you read the story you can tell that she grew up frum. she does have some things that are not correct about judaism but only someone frum would know this. i think that its irrelevant. what bothers people very much is that she grew up in the system and she rejected it and she is not a drug addict. the worst thing she does in the book is eat treif , stopped dressing modestly and stopped keeping taharas hamishpachah. granted these render her a secular jew, but that is what she has become. a big snooze if you ask me. i am sure many who criticize feldman have never even read her book. please pardon this spoiler if you plan on reading the book, but i do feel that it is very important to share this . at the end of the book after she has settled on her secular life she realizes that the frum world does not bother her as much as it had before when she was part of it. she also has come to appreciate that judaism is part of what makes her who she is even if she does not choose to be observant. she is not a druggie,she did not form a ponzi scheme, she is just isnt religious. so what. i think that feldman got a little carried away slamming frumkeit when she went on the view with barbara walters and company, but i do not think that this will hurt the world view of religious jews or hasidim . it think that we need to worry more about the frum men who are sitting in jail for having commited ponzi schemes for making a bad name for frum jews. deborah feldman is 25 years old. her youth does not excuse her ,but it does not make her the devil either. simon and shuster encouraged her to use her name with her story to make this into a sideshow. had she been anonymous it would not have been as "potent". deborah feldman is the flavor of the month now with her book but in a few months no one will care who she is. in 1995 a young woman named pearl abraham wrote a book called the romance reader which was also about a rebellious hasidic girl with another disfunctional family. she too garnered much attention. it was pre-interenet days so her reputation did not precede her as did deborah feldman's and i thought that her book was much more negative than deborah's. interestingly enough, deborah feldman mentions that she had read pearl abraham's book as a teenager and that it spoke to her. then again, deborah feldman was already going in the wrong direction when she read the romance reader, so one can't say it really swayed her. according to wikipedia , pearl abraham has taught at sarah lawrence , the school deborah feldman attended. perhaps they have met. unorthodox is not the best book i have ever read nor is it the worst. it is entertaining and i do not take everything in it at face value. though she gets some thing wrong, she gets a lot right and this is what irks a lot of people . the only thing that bothers me is that she has photos of her ex-husband in the book , not even so much what she wrote about her marriage.i think that they both misunderstood each other. i don't think that it was fair to him to have his image in the book without his permission. in any event , read the book if you are curious. i am sure it will be a big letdown after all of the hype. it is not so much anti religious as much as just one young woman's quest for living life in a way that is best for her. Labels: deborah feldman, frum, non-religious, religious issues, satmar, unorthodox. by friday i am always exhausted from a busy week at work. i am always looking forward to a restful , sleep filled shabbos. when i did not work on fridays i found shabbos to be must more enjoyable because i was able to rest up on friday before all the festivities . every friday i make the mad dash home before shabbos so i can prepare for shabbos. this is especially difficult because all i ever want to do when i get home from work is sleep for a few hours, but on friday i must shower , prepare / heat up food and make sure everything is ready for the impending shabbos. now that shabbos starts a little later its a little easier, but i am still stressed. sometimes i am invited out for friday night dinner which is nice but delays my shabbos rest. other times i eat dinner at home and go to an oneg at someone's home. this is a little more restful because i always manage to sleep a bit before joining the festivities. i try to get 7-8 hours of sleep friday night before waking up on shabbos morning. if i am home for friday night dinner it is easier to wake up early on shabbos morning and read a little bit before going to shul . if i have lunch plans it is nice but with these short shabboses i am assured little or no shabbat nap or i am graced with a nap that starts on shabbos and ends motzei shabbos. i find it slightly unsettling to wake up motzei shabbos. sometimes when i eat shabbos lunch at home there are afternoon get togethers which last until havdalah. the shabbat socializing is amazing for the soul. to be alone on shabbos is the worst. after a grueling week of work a social shabbos really helps me decompress. it really isn't shabbos menucha. it is just a rest from the work week schedule. sometimes when men divorced men remarry they remarry women who are significantly younger than their first wives. its almost like they have traded up for a younger edition. to be fair some of these men who are remarrying are divorced from their first wives because their first wives initiated their separation. it is hard to know what to think. these younger women aren't being forced to marry older men. i would say that it does depend how much disparity there is in the ages of the couple. if there are about ten years difference plus or minus a few years i don't think its such a big deal. i think that if there is a twenty year age disparity that it is a bit disturbing because sometimes the man has children who are close in age to their young bride. i think that if a man has never been married and he marries a much younger woman it is a bit different because he is not thinking that he could have a daughter her age he is just thinking its cool he is marrying such a young woman. personally, i am looking for a man who is within ten years of my age because i feel most comfortable with someone who is of my generation. if someone prefers the may/december pairing it is their business. different strokes for different folks as they say. purim is upon us. i love the ronald mcdonald blow up doll that i saw outside of hocus pocus on avenue m. i also like that no one blocked out the faces of the girls in the pictures on another purim store on coney island avenue.